The Sewage Treatment Plant process is similar to the way that a Septic Tank works but mechanical components provide a process to help break down solids to produce a cleaner, more environmentally friendly effluent. The treatment system consist of pre-treatment for removal of floating & gritty materials, primary treatment for removal of settle able solids and secondary treatment for removal of dissolved organic matter contributing to COD/BOD. In few cases tertiary treatment is also introduced for getting the polished effluent for reuse, comprising of filtration, hardness removal, ultra-filtration and reverse osmosis system depending upon the specification and use. 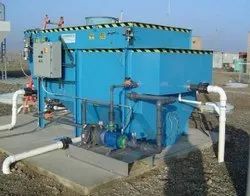 Anaerobic digestion facilities are also provided for the treatment of sludge can be handled on dewatering centrifuge / belt filters and sludge drying beds.